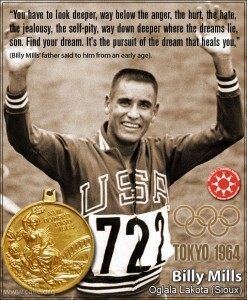 Celebrate with Billy Mills & the Double Road Race! Billy Mills comes to Kansas City for the first annual Double Road Race of Overland Park, KS as a part of his birthday celebration in which the Kansas City Track Club is honored to host Friday the 28th, two days before the first Double Road Race 2013. Billy Mills is the last American distance runner to win a gold medal at the 1964 Olympics in the 10,000 meters in what is considered one of the greatest upsets in Olympic history. Come hear an inspiring message from Billy as he turns 75. A graduate of KU, Billy is coming back to the Kansas City area as part of the festivities of the Double Road Race. Be sure to check out this challenging event that takes place just two days later in Overland Park. Cost: $12. gets you an Italian Dinner (Billy’s favorite), cake, a beer and KCTC members receive a Billy Mills Poster for autographing. Additional beer tickets will be available for $2.